CAMP BGen. 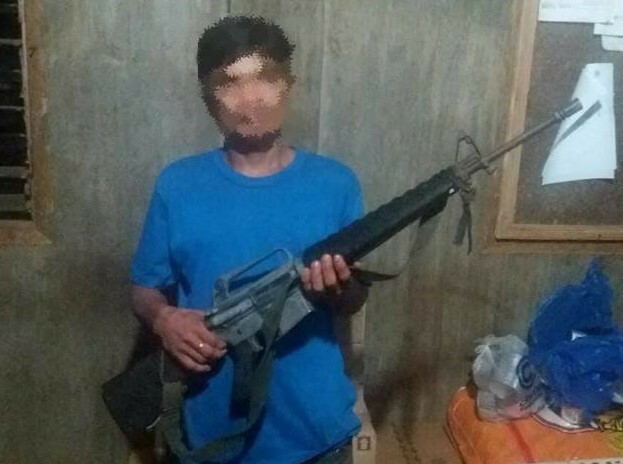 Agaab, Malungon, Sarangani – A platoon officer of the terrorist group New People's Army in Malapatan, Sarangani surrendered along with his M16 rifle to the troops of 73rd Infantry Battalion (IB) in Barangay Upper Suyan, Malapatan, Sarangani Province, Tuesday afternoon of January 23, 2018. According to Simeon Miguel alias Simpak, 22 years old, married and resident of Barangay Upper Suyan, he decided to leave the armed group because of the fear of being killed in the firefight and the exhaustion of hiding from the government troops. It can be recalled that series of encounters transpired in Malapatan, Sarangani Province last week which turned the troops of 73IB to intensify its pursuit operations to maintain peace in the municipality. Lt. Colonel Marion Angcao, 73IB Commander described the recent surrender as "a manifestation of their relentless efforts in winning the peace in Malapatan and free the municipality from the influence NPA terrorists." Meanwhile, Colonel Roberto Ancan, 1002nd Brigade Commander said that "the brigade is always open for NPA who are willing to surrender and enjoy the peaceful life. The government has a program that will provide livelihood assistance to help them start a living,"
Accordingly, the former rebel will be presented to the Local Government Unit (LGU) of Sarangani for immediate assistance and to enroll him in the CLIP (Comprehensive Local Integration Program). He will also be provided with livelihood assistance to start a new and peaceful life in the folds of the government.